KAIST has selected the ten most outstanding projects of 2016 conducted by its faculty and researchers. This selection embodies the KAIST research portfolios that translate their discoveries into meaningful and measurable impact toward a better world. All of them demonstrate exceptional creativity, which open new research paths for each field in its novelty, innovation, and impact. Professor YongKeun Park and his colleagues develop a powerful technique to measure 3D images of live cells without labeling agents. This technique, called 3D holographic microscopy or holotomography, will open a new avenue for the study of cell biology and its applications in medical diagnosis. This research also led to the founding of a start-up company Tomocube Inc. and the successful commercialization of the technique. Professor Park and his research team developed a solution based on digital holography technology used to visualize 3D refractive index tomograms of live cells without staining. 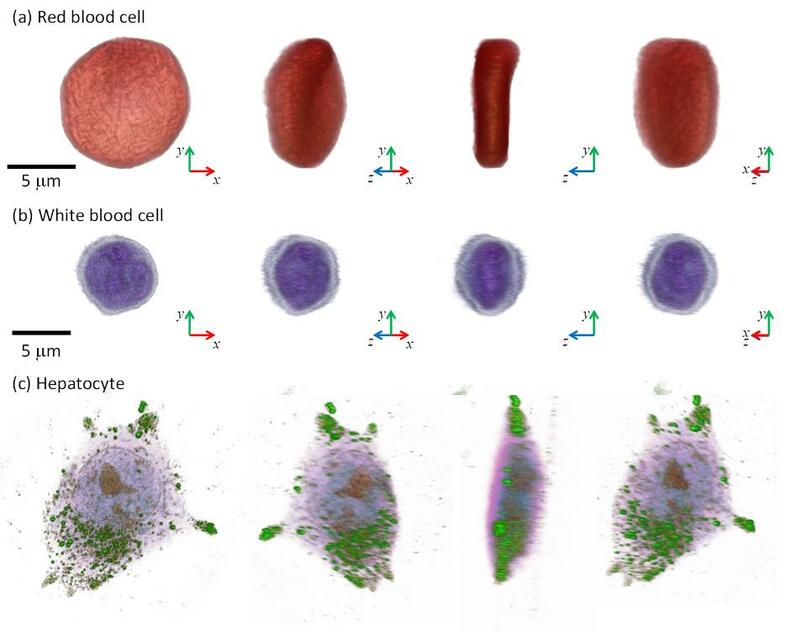 This allowed the real-time observation of biological cells in 2D, 3D, and 4D without the use of labeling agents. Conventional techniques for 3D cell imaging requires the use of labeling agents such as fluorescence dyes and proteins, which prevent from investigating the physiology of intact untreated cells. In particular, label-free imaging capability becomes more important in several emerging fields such as stem cell research and immunotherapy. The team employs the concept of 3D digital holography to achieve the optical measurements of 3D refractive index tomograms of live cells and tissues. Also, a digital micromirror device (DMD), which has been used for DLPTM projectors, was utilized to steer a laser beam for 3D measurements. Tomocube, founded from seed money funded by the EndRun Project of the Institute for Startup KAIST, succeeded in the commercialization of the 3D holographic microscopy and established an international distribution network in more than ten countries. It now has started exporting the product to several countries. The microscopes are being used in several leading research institutes including MIT, German Cancer Center, Pittsburg Medical Center, and Seoul National University Hospital Selected as one of the top ten mechanical technologies of 2016 by the Korean Society of Mechanical Engineers, the team raised four billion KRW investment from industry leaders including Soft Bank Venture Korea, Hanmi Pharmaceutical, and InterVest investment. Professor Hee-Sung Park developed a new strategy for installing authentic post-translational modifications (PTM) into recombinant proteins. Most essential biological processes are controlled by PTM, which plays a critical role in metabolic changes. 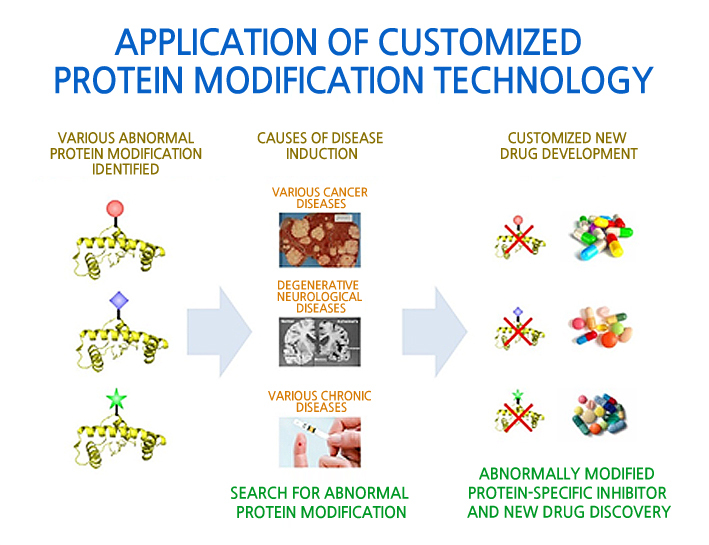 However, abnormal protein modification aroused by environmental or genetic factors induce diverse diseases such as neurodegenerative diseases, cancer, and many other chronic diseases. Professor Park has conceived a novel chemical biology route to achieve authentic and selective chemical modifications in proteins.He first used the established O-phosphoserine (Sep) orthogonal translational system to create a Sep-containing protein. The Sep residue is then dephosphorylated to dehydroalanine (Dha). Finally, Zn-Cu is conjugated to Dha of alkyl iodides, which enables it to form chemo-selective carbon-carbon bonds. This approach offers a powerful tool to engineer designer proteins with diverse chemical modifications, providing a novel platform for investigating numerous diseases and drug development including for cancer and Alzheimer's. Furthermore, this research will allow mass production of abnormally modified proteins that could induce diseases, opening up new prospects in disease treatment research. It will help to enable investigation and discovery of new drug inhibitors that directly target abnormally modified proteins. Professor Ryong Ryoo’s team presented a scaled-up carbon synthesis viable for practical applications such as Li-ion batteries and catalyst supports. Zeolite-templated carbon has an extremely large surface area and a regular microporous structure. As a result, it was expected to show excellent performance in various applications, such as for electrode materials or catalyst supports. However, until recently difficulties in synthesis have hindered research on application and properties of zeolited-templated carbon compared to other porous carbon materials. Professor Ryoo’s team demonstrated that lanthanum ions embedded in zeolite pores lowered the temperature for carbonization of ethylene or acetylene. In this contribution, a graphene-like carbon structure was selectively formed inside zeolite template without the non-selective carbon deposition. Single crystal X-ray diffraction data revealed that carbon formed along the micropore surface. After removal of zeolite template, the carbon framework showed high electrical conductivity. His synthesis method not only allowed selectivity in ethylene carbonization inside zeolite pore but permitted the diffusion of carbon material even when a large amount of zeolites was synthesized at once, allowing mass production of carbon. Thus, this method is expected to accelerate research on the application and properties of zeolite-templated carbon. Professor Haeshin Lee’s team invented a hemostatic hypodermic needle, which prevented bleeding of punctured tissue during and after injections. Bleeding unavoidably accompanies injections when a conventional needle penetrates tissue. Though the scale of bleeding from controlled injections does not cause harm to healthy individuals, uncontrolled bleeding may bring serious complications for those who suffer from hemophilia, coagulopathy, or who have been exposed to infectious diseases. Professor Lee’s hemostatic hypodermic needle is coated with partially cross-linked catechol-functionalized chitosan that undergoes a solid-to-gel phase transition in situ to seal-seal punctured tissues. The team reported a complete prevention of blood loss following intravenous and intramuscular injections in animal models. They observed a 100% survival rate in hemophiliac mice following a syringe injection into a jugular vein. The self-sealing hemostatic needles may help to prevent complications associated with bleeding in clinical settings such as for diabetic patients who experience delayed hemostasis and in the procedure of biopsy thereby preventing profuse bleeding. Professor Heung Kyu Lee identified an immunological mechanism of commensal microbiota against herpes virus infections. The protective mechanisms of commensal bacteria against viral infections was limited to how immune inductive signals are provided by commensal bacteria for enhancing innate and adaptive immunity. Until Professor Lee’s research discovery, whether, or how, commensal bacteria might influence the effector arm of immune responses such as effector T cells to eliminate infected virus remained unknown. Professor Lee’s team demonstrated that dysbiosis within the vaginal microbiota resulted in severe impairment of antiviral protection against HSV-2 infection. IL-33 released into the vaginal tract after antibiotic treatment blocked the ability of effector T cells to migrate into vaginal tissues and secrete the antiviral cytokine, IFN-γ. 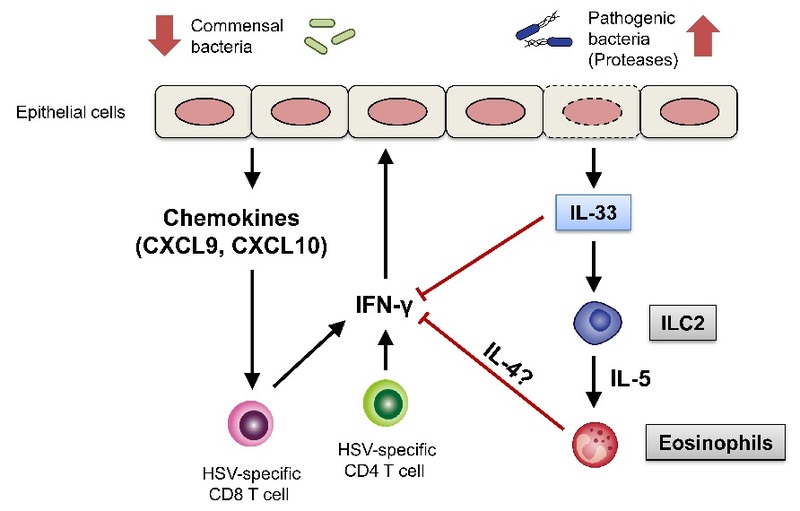 Thus, the findings suggested a previously unstudied role of commensal bacteria in the effector phase of the antiviral immune response against genital herpes. These findings provided insight into the mechanisms by which the secretion of proteases from opportunistic pathogens in susceptibility to various sexually transmitted pathogens might induce type 2 immunity within the female genital tract. Promoting awareness of overuse of antibiotics, the research is expected to contribute to the development of viral vaccines with enhanced defense capacity by regulating commensal bacteria to promote health. Professor Jung-Ryul Lee’s team for the first time developed a mobile laser ultrasonic propagation imaging system that is capable of 2500-point inspection per second and visualization of pulse-echo ultrasonic wave through the thickness of a solid medium. This novel ultrasonic propagation visualization system has been successfully prototyped for the application of in-situ and in-process nondestructive evaluation of aerospace structures. The real world proof-of-concept was achieved by testing the new system in the inspection of a space launcher fuselage (KSLV-II), control surfaces of military transport (CN-235), and the brake disk of F-16, guided weapon fuselage. In addition, the system has passed F-16 standard specimen test done by Korea Air Force and got a US patent. The prototype which was developed over a period of two years has been successfully delivered to Korea Air Force last December. Furthermore, Boeing has expressed interest in prototype development project and KAIST OESL has been selected as the Boeing-KAIST technical contact lab and received a two-year grant from Boeing. The second prototype is under construction for Boeing and the third prototype will be delivered to an optional research institute and used as a standard inspection instrument. Professor Min H. Kim’s team proposed a novel 3D imaging method that allows the capture of not only color pictures but also corresponding depth images while traditional cameras capture just color pictures. Depending on the polarization state of light, the incident light on a birefringent material such as calcite can be refracted into two different angles. This physical phenomenon is called double refraction. Whereas traditional stereo imaging requires at least two stereo cameras, 3D imaging method can capture depth from a single picture of double refraction. This proposed 3D imaging technique can be applied to many graphics and computer vision applications such as AR/VR applications that require color and depth information simultaneously. This technology, which could measure depth images, is currently needed for various industrial applications. The suggested method in this research to measure depth information from one photo using double refraction media accurately can be used in areas where system size and cost are important, such as mobile cameras, VR/ARs, driverless cars, and 3D microscopes. Professor Gye-Chun Cho has succeeded in making a 100% bio-based KABS (KAIST Bio-Soil) binder using biopolymer, an eco-friendly geotechnical construction material. A biopolymer is an organic polymer produced in the course of microbial activities and thus is an eco-friendly material manufactured without generating carbon dioxide. Biopolymers have been used in food, agriculture, cosmetics, and medicine as hardener and gelling agents, but have never been applied in construction. His team verified the microscopic interaction, feasibility, and strengthening mechanism of microbial biopolymers for soils for the first time in the world, suggesting that biopolymers be an eco-friendly soil binder. 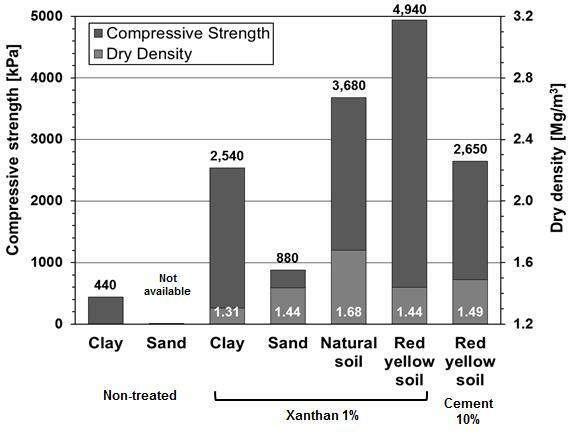 In addition to soil binders, biopolymers can also be applied to various fields of ground construction (e.g., ground improvement, grouting, erosion control, vegetation, anti-desertification, etc.). The team expects more biopolymer applications in construction since increasing demands for replacing cement-based or chemical ground materials have surged. With KABS binder, the team has performed several field tests along with industrial technology transfer underway. In collaboration with the Korea Expressway Corporation and LH Corporation, Professor Cho’s team is working on additional commercial applications. Professor Chulhee Choi’s team unveiled a new tool for intracellular delivery of target proteins, named “exosomes for protein loading via optically reversible protein-protein interactions” or “EXPLORs”. Nanoparticle-mediated delivery of functional macromolecules is a promising method for treating a variety of human diseases. Among nanoparticles, cell-derived exosomes have recently gained attention as a new therapeutic strategy for the in vivo delivery of nucleotides and chemical drugs. 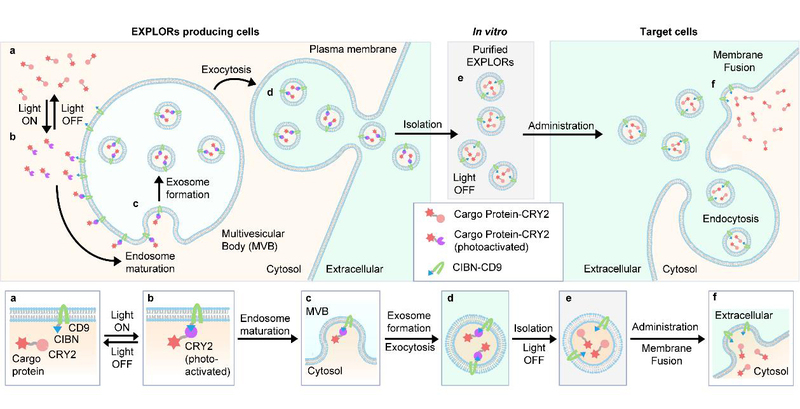 By integrating a reversible protein-protein interaction module controlled by blue light with the endogenous process of exosome biogenesis, the team successfully loaded cargo proteins into newly generated exosomes. Treatment with protein-loaded EXPLORs is shown to significantly increase intracellular levels of cargo proteins and their function in recipient cells in vitro and in vivo. These results clearly indicate the potential of EXPLORs as a mechanism for the efficient intracellular transfer of protein-based therapeutics into recipient cells and tissues. This technology has been transferred to KAIST bio-venture Cellex Life Science, Incorporated for commercialization. Professor Jeong Young Park’s team developed a novel catalytic nanodiode consisting of a thin metal catalyst deposited onto a semiconductor support. The team succeeded in observing in real-time hot electrons created in the course of catalytic reaction occurring at atmospheric pressure or at liquid-solid interfaces. Use of a noble catalytic nanodiode is a new measurement system that detects hot electrons produced on catalyst surface through atmospheric pressure and liquid chemical reaction in real time that allows direct identification of the catalytic activity of catalytic reactions. In particular, the system allows macro-observation of hot-electron movements that change with the type of nano-catalyst without high-priced equipment in atmospheric pressure and liquidation, and thus is not limited to experimental conditions such as in ultrahigh vacuums. Therefore, it could be applied in the future to analyze complex chemical reaction mechanisms of catalysts used in high temperature and various pressure conditions, and to develop high efficiency next-generation catalyst materials. This finding may lead not only to the fundamental understanding in the mechanism of the catalytic reactions but also to the development of next-generation catalysts with enhanced catalytic performance.